Eversince the Chicago Bulls acquired the likes of Joachim Noah and Derrick Rose, I've been secretly wanting them to continue winning in the playoffs. Why? Cos I thought the team had the potential to be a big threat in the East. With both Luol Deng and Carlos Boozer, Chicago Bulls is now (after more than a decade) a top contender in the East. They won 7 of the last 10 games and have just finished defeating the much hyped-up Miami Heat. 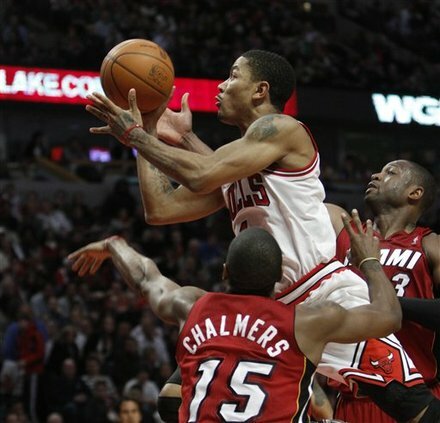 Chicago Bulls fans are now on serious lobbying and voting to have their prized Derrick Rose awarded as a starting point guard for the upcoming 2011 NBA All Stars to be held at the Staples Center in Los Angeles, California. And when that happens, the 22 year old Chicago native will definitely become more celebrated, perhaps will be included on the "next Michael Jordan" discussions. Since he is from the Bulls, I think it is only rightful that Derrick Rose will be considered to be one of his Air Apparents. I'm now officially a Derrick Rose fan. His no-nonsense anti-drama persona (unlike LeBron) plus his convincing performances game after game makes me think that this kid might after all, be for real. No LeBron James-like hoopla. Just a Derrick Rose in full bloom in the middle of Chicago. my man never looked back at the bulls since jordan left. baka ngayon magbalik loob siya, hehe. i remember the day when air jordans were famous. it was the time when backstreet boys were cool on all-girls schools. haha! tell your man to love the bulls again! wooohooo!